The musical with a book by Jeff Whitty (Avenue Q) is an adaptation of the film of the same name, though from what I've heard (I've not seen the original) it's more inspired by the story than a direct replica. In the theatrical version preppy Campbell, captain of the cheerleading squad at Truman High, is transferred to Jackson High in her senior year where she tries to convince the dance crew to become her new squad so she can make her National Championships dreams a reality after all. But with friendships stretched to the limit and frenemies ready to sabotage the competition, can Campbell turn the crumbling odds in her favour? After seeing a Tony performance of Bring It On years ago I've been hoping for this cheerful show to come to the UK and I'm thrilled Southwark Playhouse is now giving London audiences the chance to experience it too. I've seen many great musicals there over the years as it's a fantastic location for smaller or more niche shows to get a British try-out. And what's even more fantastic this time around is that this is another production by the British Theatre Academy, meaning that young performers get the opportunity to showcase their talents in a show that gets a proper run. And they once more rivalled their West End counterparts with unanimous fantastic performances (I even recognised a few faces from 13 The Musical). Robyn McIntyre was a competitive and somewhat annoying Campbell with a strong performance throughout, though it was Isabella Pappas who really excelled as mean girl Skylar with a killer voice (not to be confused with catchy tune Killer Instinct, performed hilariously over-the-top by Sydnie Hocknell as Eva). A shout out must also go to Kristine Kruse as Bridget, the underrated mascot at Truman High turned popular girl at Jackson High. I loved everything about her storyline arc, character development and endearing performance. You go, girl! While the cast were all excellent this is a show which relies heavily on its solid score for being so darn enjoyable. The music is written by musical theatre legend Lin-Manuel Miranda (yes, him off Hamilton) and Tom Kitt (Next to Normal) and the lyrics are by Lin-Manuel in collaboration with Amanda Green (High Fidelty). And man that music! I already mentioned Killer Instinct as a super catchy tune, but I also loved the rest of the songs – especially bigger ensemble numbers like It's All Happening (which sounded like a mixture of Hamilton's My Shot and Satisfied) and Do Your Own Thing. A cheerleading show at its core, besides the super catchy tunes it's of course the choreography that makes it a stand out. While the small stage at the Southwark Playhouse doesn't allow for the same level of amazing acrobatics as the Broadway show, there are still plenty of great dance sequences for the eyes to feast on – and once again the cast absolutely killed it. Honestly, as a musical theatre fan wishing for this show to come to the UK I could not have asked for more than the incredible production we got. While the feel-good story is perhaps a bit too bland to stand on its own, with the fantastic score and such a talented cast doing it justice – we are very lucky indeed. Bring It On is a fun and fabulous show about friendships, frenemies and finding your own place in the world – wherever that may be. While the story is cute, it's the cast, catchy tunes and cheerful choreography that inject the musical with its oodles of charm. 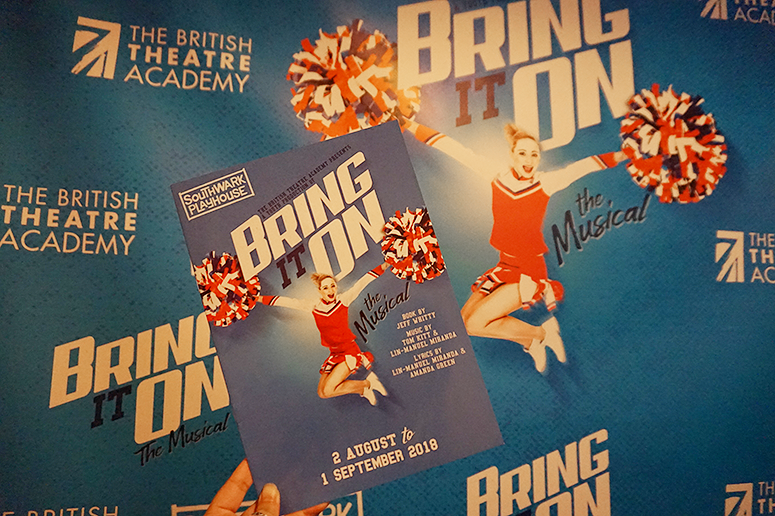 Bring It On the musical is playing at Southwark Playhouse until 1 September 2018. Book your tickets here.